As all of us struggle to remain engaged and avoid distraction, please embrace this holiday for all that it means and all that is possible when you convince friends and family to wince, shrug and continue to shop for the best opportunities. Freedom is a powerful thing. The arrival of July serves as an annual reminder — complete with exploding overhead displays — that experiencing a lifetime of successful long-term investing is a path to a different form of independence. But an investing world is fatigued and frustrated and our community is far from immune. As all of us struggle to remain engaged and avoid distraction, please embrace this holiday for all that it means and all that is possible when you convince friends and family to wince, shrug and continue to shop for the best opportunities. It’s incumbent on all of us. Make a difference. Enable freedom. 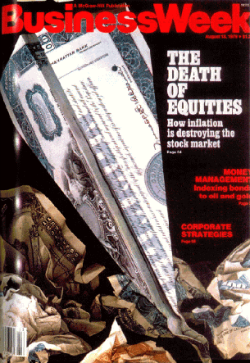 The August 1979 cover of BusinessWeek magazine lives in infamy as a poster child for historically reliable contrarion signals that point out things like “darkest before dawn” conditions. When Bears dominate the cover of Barron’s and pundits suggest it’s time to run for the hills — it’s invariably prudent to do precisely the opposite. We’re generally reluctant to make “market calls” outside of our continuous observations about the relative median projected annual return for our universe of stocks and times when specific opportunities become a little more plentiful or evasive. But we look back on 2008-2009 and our efforts to extract lessons from historical precedents. Readers will recall that we visited the Boondocks, complete with snapshots from 1974 and 1938. We explored the genesis of the triple play strategy (seeking high-return potential combined with an opportunity for margin and P/E expansion) and we’re quite proud of the difference delivered by Triple Play-centered shopping pursued while we were still in the teeth of the bear market that accompanied the Great Recession not so long ago. And it’s in that spirit that we can’t help but gasp with the events of the first few mornings of July 2012. Hollywood would reject the movie script as unimaginable. We’re going to assume that esteemed ML strategist Savita Subramanian is (1) old enough to remember the BusinessWeek cover, (2) capable of performing a Google search and/or (3) using a sensational technique to get somebody’s attention. As we understand it, Subramanian draws attention that rhinos are now more bearish on equities than they were at any point during the collapse of the tech bubble or the recent financial crisis. Coming on the heels of a fairly recent Goldman Sachs meme about the “best buying opportunity of a lifetime” who can fault a nation of fatigued and frustrated investors for fermenting distraction and indifference? Long-time readers also know that I’m generally loathe to display any historical profiles that happen to include anything before 1941, the inflection point for the modern stock market. In this case, I’m willing to make an exception. 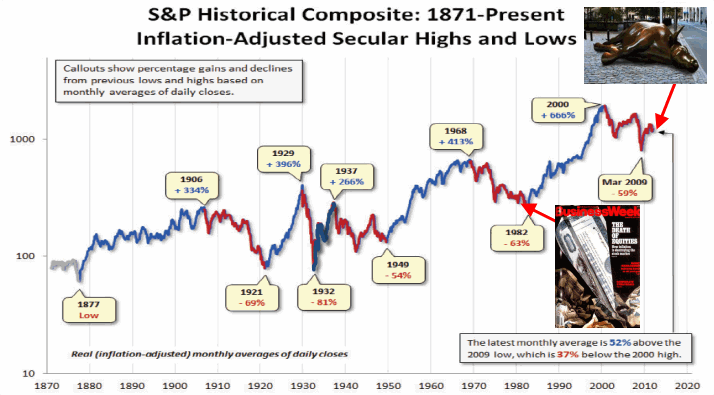 In the accompanying figure, the ubiquitous blogger Barry Ritholtz of The Big Picture shared a long-term perspective on secular bear and bull markets. We like long-term perspectives around here. Legacy of Lost Decades. The current version of a Lost Decade should actually serve as a powerful reminder that this isn’t the first time that we’ve “lost a decade.” Focus your attention on the powerful blue trends (secular bull markets) that have followed previous renditions of lost decades. The last one started not long after that infamous BusinessWeek magazine cover. Grit your teeth. Hold your nose (if necessary). Hug a friend or family member and get ready. Invest like there’s a tomorrow. In a recent interview on Bloomberg, Ritholz joined with another one of our favorite rhinos, David Rosenberg, to talk about the outlook for markets. In addition to the visual evidence, they both feel that the current secular bear market will send sometime in the next 3-7 years. Ritholtz shared that a common stock allocation of at least 50% is probably prudent. Barry holds out tactical asset allocation as a means of capital preservation blended with vigilant participation in common stock investing — a position shared by the likes of Jeremy Grantham. Different This Time? We know how dangerous the question is. 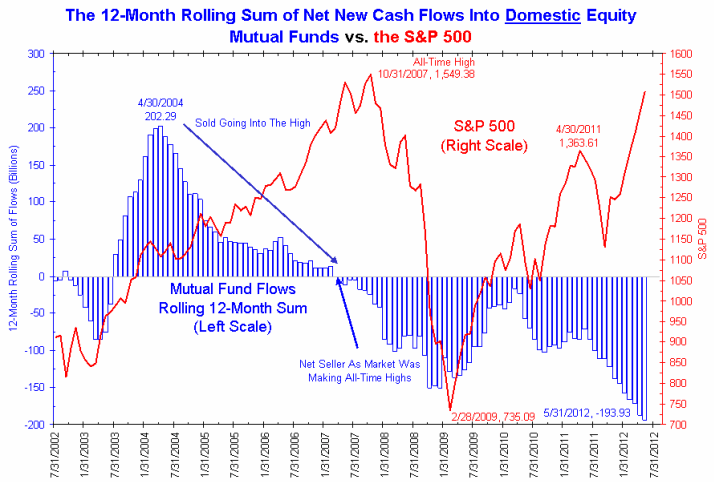 But frankly, we’re concerned about the shift in investing behavior displayed. In the past, those market lows would have been accompanied by accumulation and new highs greeted with inflows and some semblance of “chasing.” The exodus and potential indifference is palpable. We’re big believers in individual stock selection potential, a la Grantham’s emphasis on quality companies and his firm’s methods that include honoring mean reversion even if it riles rhinos in general. We’ll be taking a look in the MANIFEST Forum at 1979 and the conditions prevalent while the ink was drying on that BusinessWeek cover. 3-7 years? What was the outlook between 1979 and 1982? What lessons can we deploy from the experience of waiting for the secular bull market to find second gear. One thing we do know: the opportunities (incrementally superior returns) will likely be a work-in-progress by the time most rhinos and herds of average investors notice. Fatigued & Frustrated? Fire up! Might it be different this time? Perhaps. In comments made by leading investment advisor, David Kudla of Mainstay Capital, he expressed concern about “the cookie-cutter, potentially conflicted advice” made possible by recent 401(k) legislation regarding computer models. Our nutshell? The financial services industry is far too willing to prey on the disinterested masses with the likes of target-date funds and asset allocation-based general models based on potentially unfounded under-performing theories. The fatigued and frustrated are not expected to intervene. Predatory rhinos count on it. This is where you and morning coffee in July come in. Grit. Hug. Invest.